Instantly provides a thicker and fuller appearance to thinning hair. Dyes temporarily grey hair until first shampoo wash. Enriched biotin and keratin, nourishes hair. Hair looks healthy and revitalized. Shake well before use. Apply to clean and dry hair by spraying in circular motion from 10-15 cm direction. Blow dry gently and give style with combing tips. Do not touch your hair after the application. For external use only. Flammable. Do not use near flame or while smoking. Use only in ventilated areas. Avoid spraying in eyes. Use only as directed. Avoid excessive inhalation. Contents under pressure. Do not crush, puncture, or incinerate. Do not store at temperatures above 50°C. Keep out of the reach of children. 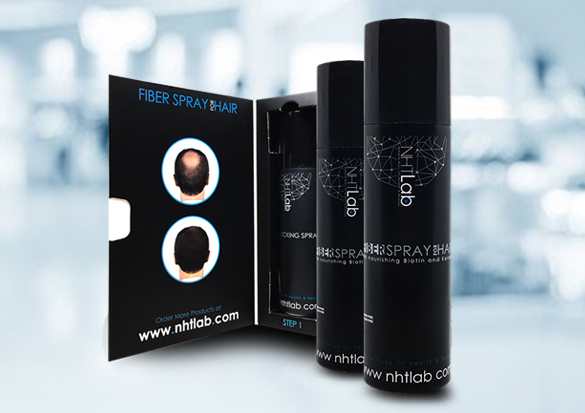 DO NOT FORGET use NHTLab Hair Locking Spray after application of Fiber Spray for Hair. Butane, Propane, Isobutane, Alcohol Denat., CI 77499, CI 77492, CI 77491, Parfum, Acrylates Copolymer, Triethoxycaprylylsilane, Biotin, Hydrolyzed Keratin, Benzyl Salicylate, Citronellol, Alpha-Isomethyl Ionone, Butylphenyl Methylpropional, Linalool.